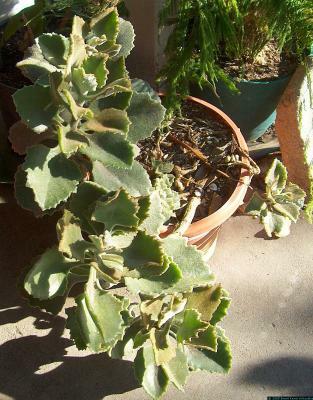 Kalanchoe beharensis is one of the hardiest plant in my collection. It can take any kind of soil, any amount of water or lack of it, any amount of light, and I've never seen a pest of any kind here in south Texas. It can take a light freeze, although in 2004 when we had six inches of snow and sub-freezing temperatures for 36 hours, and it died back to the ground. It's slow growing, but it did grow back after about three months.